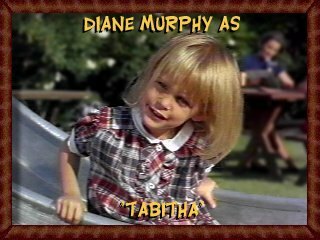 Diane Murphy was born five minutes before her twin sister Erin on June 17, 1964, at St. Joseph's Hospital in Encino, California. Following the double birth, their mother, Stephanie, gave up her job as a teacher to devote herself full-time to the girls. Wherever she took them the twins drew attention. When a talent agent wanted to sign them up, Stephanie and her husband, Dan, agreed to give it a shot. Unlike her twin sister, Erin, Diane Murphy was never interested in the acting profession. Today, she has an M.B.A. in management from Golden Gate University, Santa Barbara, and a bachelor's degree in psychology and sociology from the University of California, Santa Barbara. She is the associate executive director of Shelter Services for Women, a nonprofit organization that operates three shelters for battered women and their children in Santa Barbara. Her primary duties are grant writing, contract management, and budgeting. Diane, who is openly gay, is also a member of the board of directors of the Greater Santa Barbara Community Association, an organization comprised of business, professional, and community members who are gay and lesbian. Diane served as chairperson of the association's committee, which gives scholarships to gay and lesbian students based upon their grades and community involvement. At the moment she's single and living with her cat, Sugar, in a Santa Barbara condo. "I'm very happy with my life," she says. "I loved working on Bewitched, and it gave me some very unique and wonderful experiences, but eventually I wanted to lead a more regular life. So I quit the entertainment business when I was thirteen years old." Before she left Hollywood, Diane appeared in numerous commercials (including one with Henry Fonda), and television shows such as the ABC Afterschool Special, The Magical Mystery Trip Through Little Red.